Makiko Futaki (June 19, 1958 – May 13, 2016) was a Japanese animator best known for her work at Studio Ghibli for more than thirty years. Futaki, who joined Studio Ghibli in 1981, worked on all of Hayao Miyazaki’s animated feature films, beginning with Nausicaä of the Valley of the Wind in 1984. Her best known Studio Ghibli’s productions include My Neighbor Totoro (1988), Princess Mononoke (1997), Spirited Away (2001), which won an Academy Award for Best Animated Feature, and Howl’s Moving Castle (2004). Her last film credit was Hiromasa Yonebayashi’s When Marnie Was There (2014), which is Studio Ghibli’s final feature film to date. Futaki began her career as an animator of cine-calligraphy films at the Private Animation Festival (PAF). Her first animation credit was an episode Lupin III in 1979, which began her career in film and television. 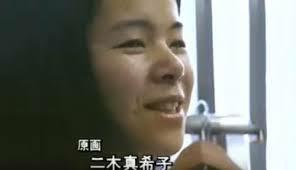 She then worked on the Jarinko Chie, a production by Isao Takahata. Her work reportedly impressed Takahata. In 1981, Takahata and Hayao Miyazaki, the co-founders of Studio Ghibli, hired her to work on their film, Nausicaä of the Valley of the Wind (1981), which began her thirty-year relationship with the studio as a freelance animator. In addition to her extensive work at Studio Ghibli, Futaki was an important animator for the 1988 anime feature film adaptation, Akira, directed by Katsuhiro Otomo, and Royal Space Force: The Wings of Honnêamise, which was directed by Hiroyuki Yamaga in 1987. Makiko Futaki died from an unspecified illness at a hospital in Tokyo on May 13, 2016, at the age of 57.